And like any dedicated journalist, we were put to the test - fulfilling the fantasy of cheese lovers everywhere. It was a grueling and tiresome duty, but ultimately we knew it should - nay - HAD to be done. Making a choice of where to go wasn't easy, especially with all the suggestions from you! Sure, making a grilled cheese at home is simple and cost-effective, but these sandwiches are not your mama's grilled cheese. These restaurants have changed the grilled cheese game, people! We may need to go for round two, because there are a surprising amount of options, and also, grilled cheese. One word..."unglaublich" which apparently means incredible in German. 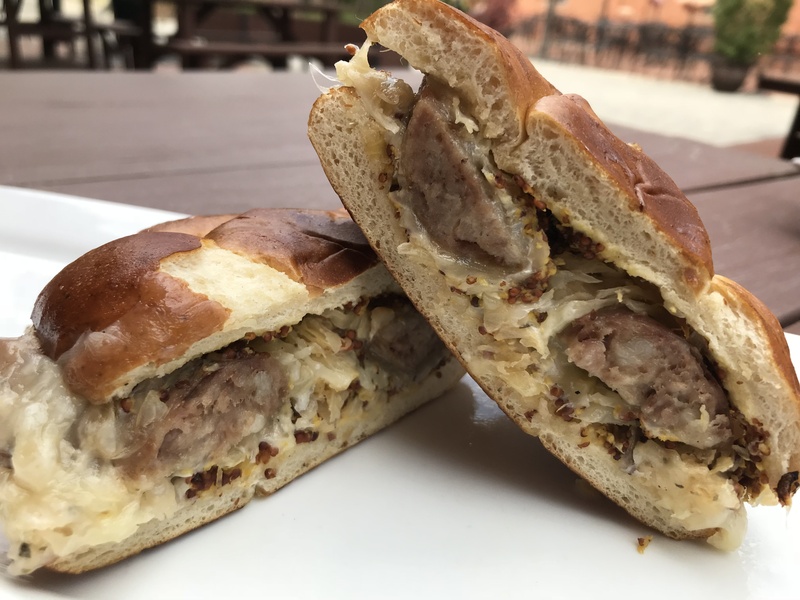 This is grilled bratwurst with sauerkraut, stone ground mustard, and white cheddar cheese is sandwiched between a soft pretzel bun. The bun was crusty and buttery, the mustard mildly spiced, and the bratwurst was thick and juicy. The only disappointment with this sandwich was the lack of good cheese pull. But you cannot judge a grilled cheese sandwich on cheese pull alone. The flavor was unglaublich. Five spatulas for flavor. Two spatulas for cheese pull. As Aristotle once asked, "When does a grilled cheese cease to be a grilled cheese?" He probably didn't ask that, but he would if he were living today! There seems to be a trend as of late to make the simple grilled cheese into a complex, comfort food all dressed up. Don't get me wrong, we're not complaining. Each of these sandwiches is a delightful trip through flavor town. 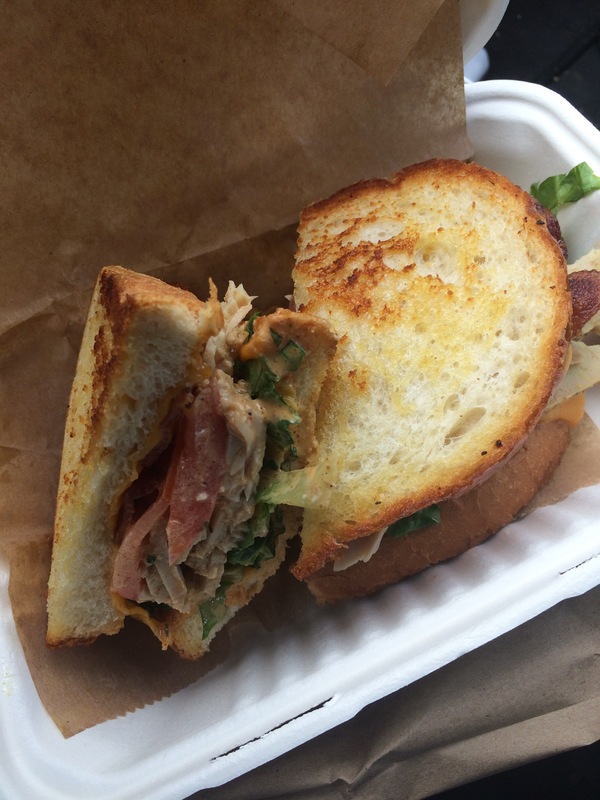 This sandwich came with roast turkey, applewood smoked bacon, sharp cheddar, shaved romaine, tomato, nasher sauce all on a griddled country white bread. Flavor was coming at us from all directions - from the juicy roast turkey to the secret nasher sauce. It is NO secret, that you should sample this sammy. Seven spatulas for buttery deliciousness. 0 spatulas for cheese pull. True to our North Carolina roots, we went with "the big cheese." Sourdough bread topped with three, count them, three different types of cheeses: cheddar, provolone, pimento cheese all surrounding a fried green tomato. Yes, we ate it. All of it. And it was delicious. The sourdough was perfectly toasted. The cheeses made a perfect blend of flavor. And the fried green tomato, at the center of it all, was still crispy. How did they achieve such sorcery? Because a person cannot live on grilled cheese alone, I'd definitely go with the housemate potato chips as the side. These are no small potatoes. And if this isn't enough for you, I highly recommend trying the fried black eyed peas. But we'll savor...I mean save... that review for Black Eyed Pea day. Cheese pull doesn't seem to be as important as it used to be. This sandwich didn't have it either. 13 spatulas for crunch. three spatulas for cheese pull. Yes, two relish grilled cheeses made the list. Your taste buds (and arteries) will not forget this sandwich. 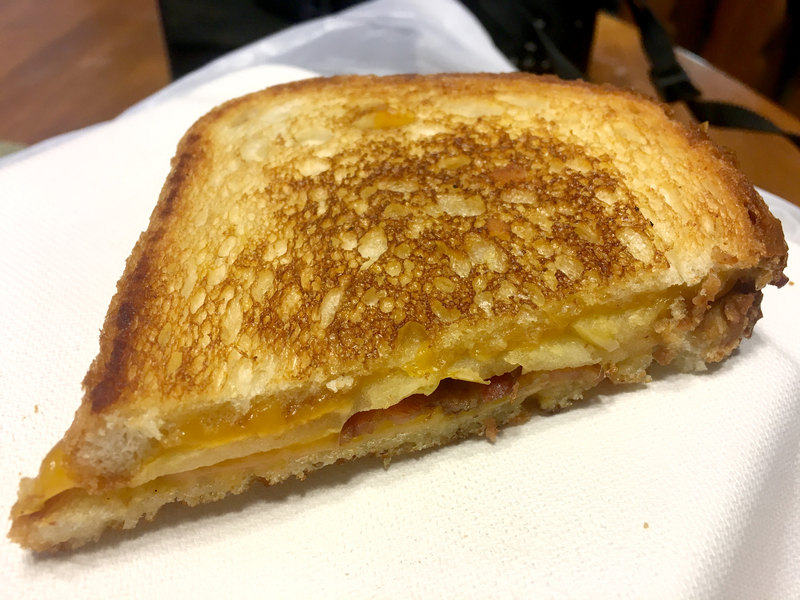 Another creative take on a classic, this Wisconsin starts off with some sourdough bread topped with sliced apples, sharp cheddar, applewood smoked bacon. How can you say "no" with an ingredient list like that? This was a cheesy-medley of savory meats, pop of sweetness, and a toasty, crispy crunch. The contrast between the sweet and salty is incredible, like a chocolate-covered pretzel. However, much like its sister sandwich, this sammy had no cheese pull. 8.7685 spatulas for sharp cheddar. .33333 spatula for cheese pull. 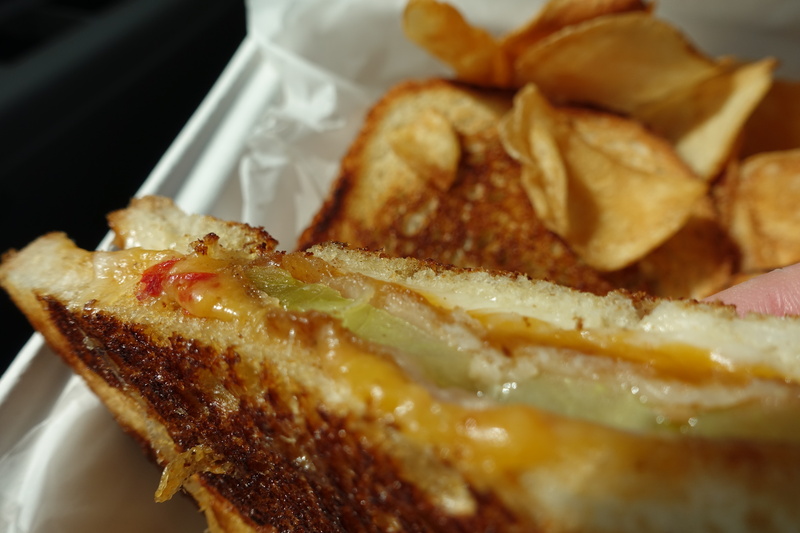 Gooey's also has a wide array of grilled cheese selections. Choose specialty choices like Spicy Fried Chicken, BLT, Bacon Cheeseburger, or go with a classic like Pimento, or Mac & Cheese Grilled Cheese. That's not a typo. Mac & Cheese Grilled cheese. 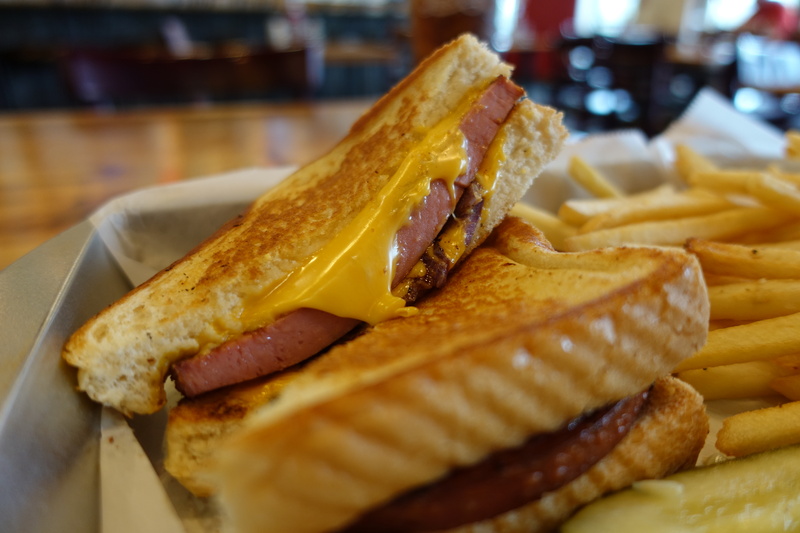 We went with the Bologna Grilled cheese because if you're gonna go out, you need to go out in style. We opted to have the grilled onions on top in order to reach that whole "five servings of vegetables per day" thing. We're talking a torrent of molten cheese oozing from golden slices of carefully crisped bread. Cap that off with your choice of chips, mac & cheese, or fries. In case you were wondering: yes, you can get a mac & cheese grilled cheese with a side of mac & cheese. If you're looking for a grilled cheese sandwich that's a step above a slice of American and some generic bread but doesn't want it overly complex, this is the place to go. Nine spatulas for cheese-reception. 37 spatulas for cheese pull. Apparently, in addition to being National Grilled Cheese Day, it is National Grilled Cheese month. It's as American as apple pie. Support this comfort food classic today. If the hankering for grilled cheese hits you hard, and you don't feel like playing chef, these are some places to try.